Are You Getting The Wrong KPI Advice? 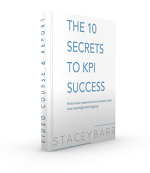 There is a LOT of information out there about how to develop KPIs and measure performance. Most of it is impractical, unproven or doesn’t work. How do you find the good advice, then? Good advice comes from people who have examined different performance measurement methodologies, have tested them and evaluated what works and what doesn’t, and have adopted practices that are clearly working well. These people might be consultants, authors, researchers, trainers or your very own colleagues. Learn from trainers who share personal war stories and client successes from their own practical experience in using what they are teaching, rather than those who give canned theoretical presentations. When I took the Balanced Scorecard Institute’s “Balanced Scorecard Professional” program, I was impressed with how rich it was with stories from the presenters’ own experience in facilitating balanced scorecards for their clients. Seek inspiration from authors who provide plenty of real-life examples to illustrate their suggestions, not just pages of ideas or theories that just sound good. Stephen Few, renowned dashboard and visual analysis expert, is a great example of an author whose books are filled with real-life examples of dashboards, both good and bad and well-critiqued, to boulster his teachings. Accept recommendations from researchers who have based their findings on well-designed and objective studies published in peer-reviewed journals, not the so-called research designed to sell products. The Centre for Business Performance at Cranfield University, with their hundreds of journal articles, research reports and conference papers, have established themselves as a world-leader in performance measurement research. Model your colleagues who use great measures that have actually led to real performance improvements, not the colleagues who say ‘this is the way we’ve always done it so you should do it this way too’. 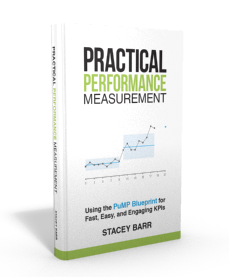 Are you deliberate and active in seeking advice on how to do performance measurement in your organisation? Or do you simply take what comes your way? Most of our struggles with performance measurement are due to not enough of the former and too much of the latter. TAKE ACTION: Think about 4 or 5 sources you have relied on for performance measurement advice. How many of them would you now consider to be credible enough to elevate your performance measurement practices, and thusly your organisation’s performance?